We deliver proven Artificial Intelligence solutions to increase productivity and enable smarter interactions with your customers and team. We do lots of useful things, but what we do best is make artificial intelligence projects easy for our clients. We take the pressure off, so you can relax and focus on the things you need to get done. 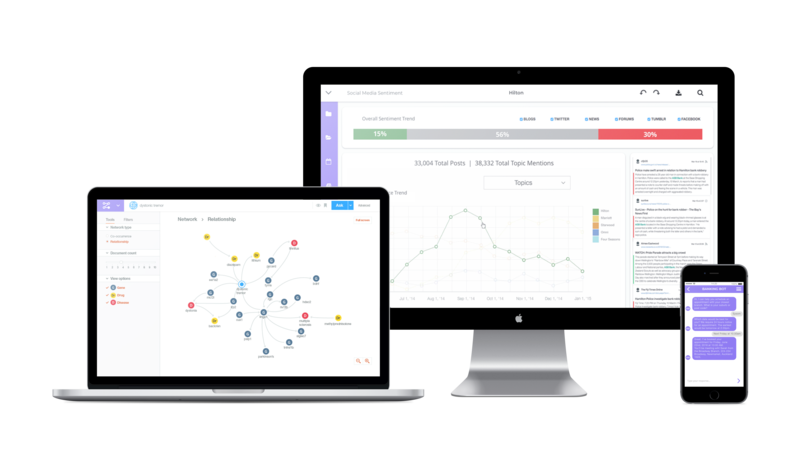 We analyse and interpret unstructured data to learn the behaviour, personality, sentiment and predicted actions of your customers. Our chatbots (virtual assistants) engage your customers and provide real-time personalisation across communication channels, including mobile devices. We automate entire business processes with powerful Machine Learning that can accurately classify your unstructured data, including images. Our Virtual Assistant delivers scalable, engaging experiences across all of your business, transforming how you interact with customers and employees. It offers a conversational self-service experience that can provide answers and take action, saving you valuable time and resources. You can easily customise your Virtual Assistant to provide custom content, product recommendations and match your business brand. The Expert Assist solution enables your team to quickly find and display answers rather than sifting through multiple systems or documents, e.g. technical and training manuals, customer data, policies and detailed procedures. Expert Assist uses AI-powered search and optional speech recognition to accurately understand questions in natural language, providing an intuitive and human-friendly interface for users. Personality Insights accurately infers the personality characteristics, intrinsic needs and values of individuals from communications such as email, text messages and social media. These insights provide you with a deep understanding of your customers and improve customer satisfaction by anticipating their needs and recommending future actions. Speech-to-Text enables the accurate conversion of audio to text by applying powerful neural network models. The solution recognises 120 languages and variants, to support your global user base. You can enable voice command-and-control, transcribe audio from call centres, and more. Text-to-Speech creates natural sounding speech in a range of voices and languages. This allows you to embed speech into IoT devices, automate call centre activities, and transform text into easily consumed audio. Real-Time Personalisation processes vast amounts of customer data with the power of cognitive technology and instantly delivers individually targeted content across channels. By optimising each interaction, you can create more relevant experiences that build greater value and brand loyalty that increases engagement and drives sales. Visual Recognition can quickly sort images into thousands of categories, detect individual objects and faces, and find printed words within images. You can build metadata on your image catalogue, moderate offensive content, or enable new marketing scenarios through image sentiment analysis. Intelligent Classification and Routing captures your customer inquiry, which can be via voice, digital (e.g., chat, email, messaging), or social (e.g. Twitter, Facebook) channels. It then applies Natural Language Understanding to automatically route the inquiry to the right person or system based on your customer's intent, context and keywords. Intelligent Process Automation (IPA) increases the power of traditional rule-based robotic process automation (RPA) with cognitive decision-making capabilities. IPA results in greater efficiency, reduced operational risks, improved response times and better customer experiences. 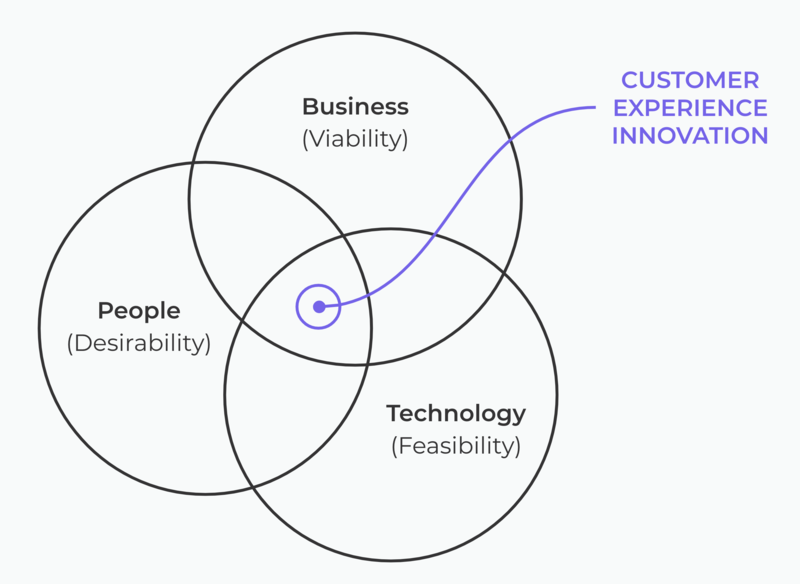 With the concepts of effective collaboration and empathy in mind, we adopt Design Thinking as a framework for understanding and solving your business challenges. There are three core considerations we measure ourselves against to provide alignment, education, and trust throughout every project. We always start and finish projects with a focus on people. We get to know the people we solve problems for then analyse their experience for opportunities to innovate. Our deep understanding of your customers helps us measure success based on their outcomes. We know every organisation has unique objectives and supporting processes. We find the alignment between your business goals and your customer needs to design solutions that benefit both. We identify the best options for your needs by selecting the most appropriate solutions from our range of technologies. Leveraging global AI and cloud platforms allows us to deliver reliable and secure solutions at scale. It’s a challenge to know how to get started when there are so many ways organisations can benefit from cognitive technologies. We give you clarity with our Opportunity Assessment Workshop. It’s customised specifically to your organisation's needs and your specific innovation opportunities with Artificial Intelligence. We’re a team of forward-thinking, collaborative Design Thinking and Artificial Intelligence specialists, doing what it takes to achieve great outcomes for our clients. Call us on 09 623 0108 for a quick chat or fill out your details below and we’ll get back to you.